The EUR/USD pair has broken the correctional channel to the downside. We think, today the price may continue forming the third descending wave with the target at 1.1375. After that, the instrument may start consolidating, break 1.1375 to the downside, and reach 1.1300. and that’s just a half of the third descending wave. 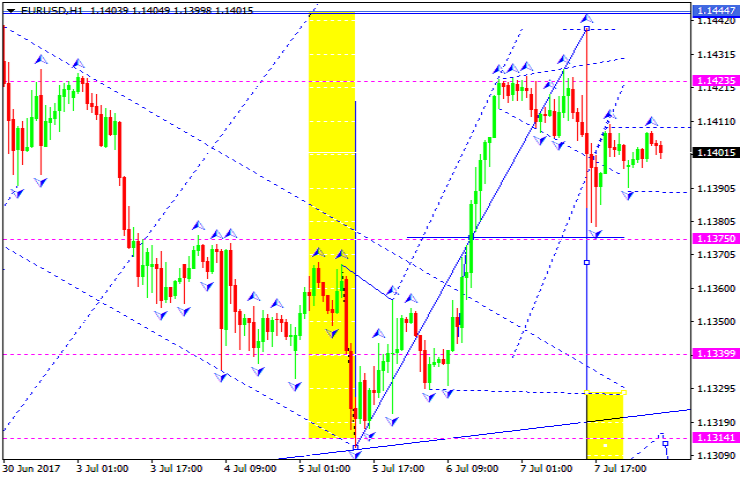 The GBP/USD pair is forming the fifth descending structure. 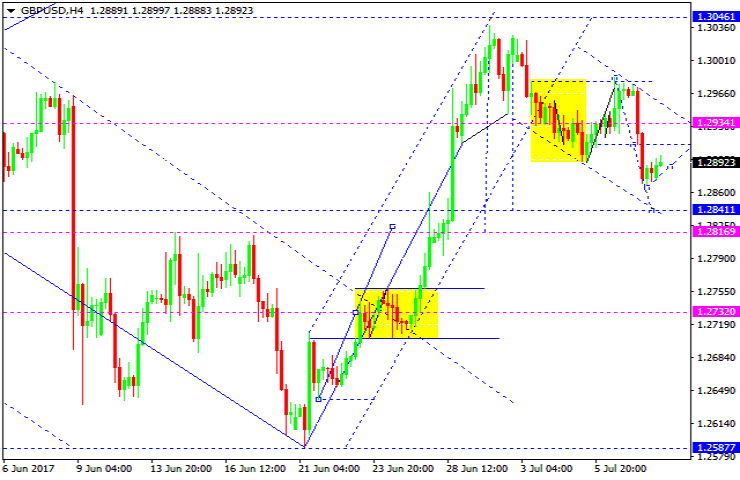 Possibly, today the price may be corrected with the target at 1.2910. Later, in our opinion, the market may fall towards 1.2841 and then start another correction to reach 1.2940. The USD/CHF pair is still growing. 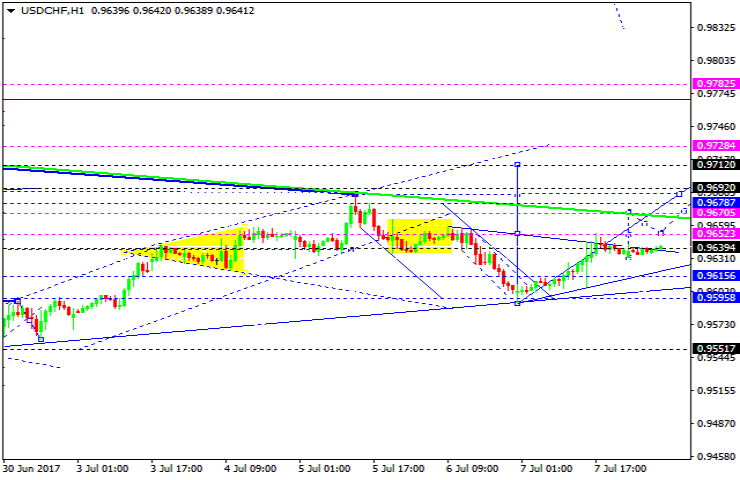 Possibly, the price may form the third ascending structure to reach 0.9690. After that, the instrument may consolidate to break the above-mentioned level upwards. The pair is expected to grow and reach 0.9782. Being under pressure, the USD/JPY pair is still growing. We think, today the price may complete the current wave and then start falling towards 112.70. Later, in our opinion, the market may break it to the downside and then start another wave with the target is 111.18. 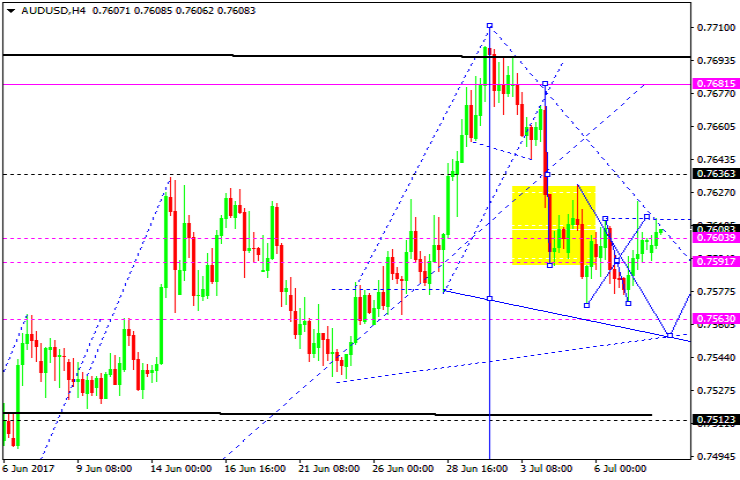 The AUD/USD pair is consolidating near the lows of the descending structure. Possibly, today the price may fall to reach a new low of this consolidating range at 0.7560, thus completing this descending wave. After that, the instrument may be corrected towards 0.7635. The USD/RUB pair is trading close to the upside border of the consolidation channel. 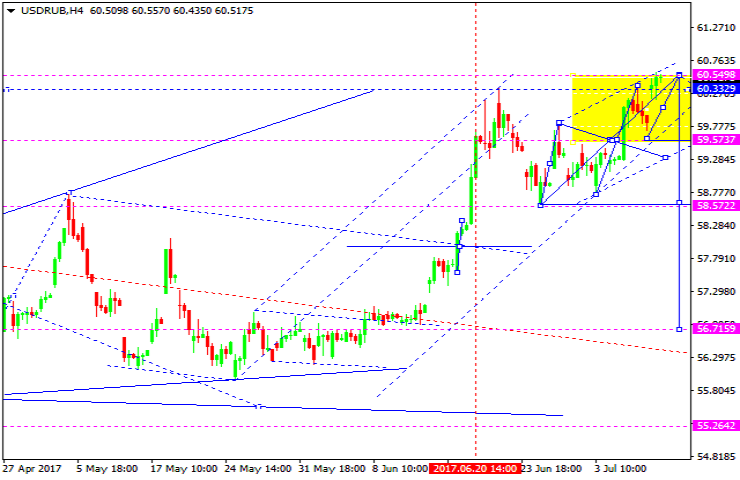 We think, today the price may fall towards 58.57. After that, the instrument may break it to the downside and then continue falling inside the downtrend with the target at 56.70. 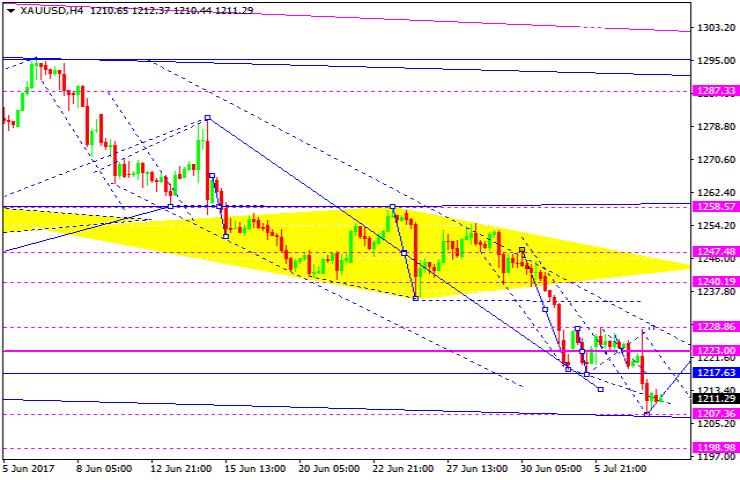 Gold has broken the consolidation channel downwards and reached the target of the first descending extension. Possibly, today the price may grow towards 1217. An alternative scenario suggests that the market may rebound and then break 1206 to expand the structure towards 1190. 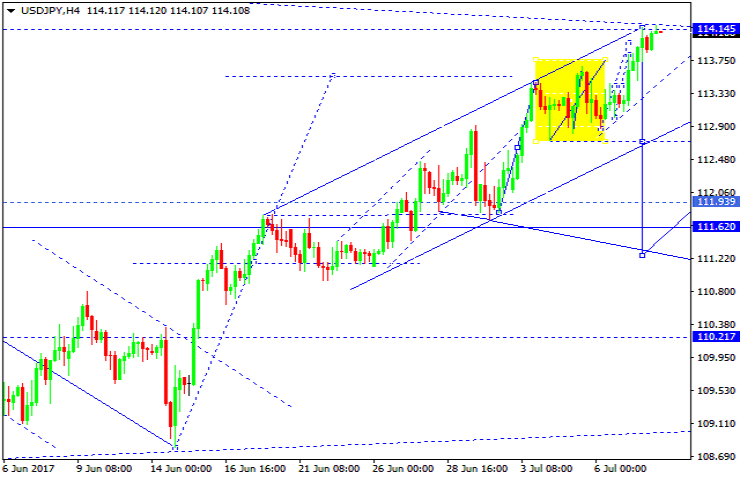 According to the main scenario, the instrument is expected to form the first ascending wave with the target at 1247. Being under pressure, Brent is moving upwards. 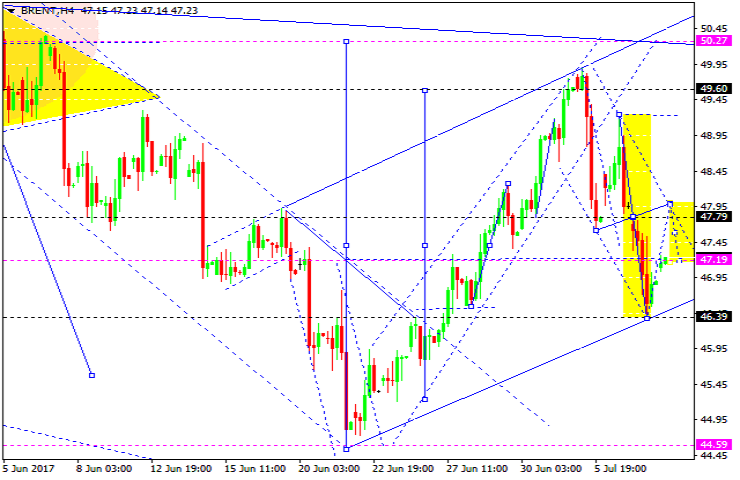 Possibly, the price may reach 47.80 and then fall towards 47.20, thus forming another consolidation channel. If later the instrument breaks this channel to the upside, the market may start another ascending wave to reach 50.30; if to the downside – form the fifth correctional structure with the target at 46.00. Later, in our opinion, the market may continue growing inside the uptrend. The first target is at 50.30.